Update 2013- All Heath dolls on this page are sold out. 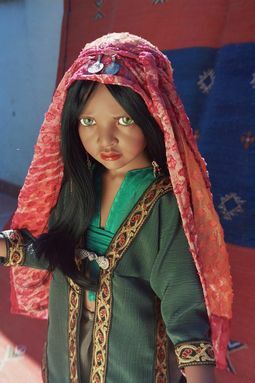 We do have 2nd market Heath dolls available which you can view on our 2nd market page. Sadly, Phillip has passed away. Classic Philip Heath is back and no one does what Philip does! These dolls are very unique to the doll market place. For those of you who have collected Philip's work...don't miss these! These dolls are all being hand painted by Philip Heath himself for a fraction of the price that they were when he sculpted for Goetz. Philip is hand picking the materials and on the dolls that are "lost" he is actually ripping and dying the material to look old and give each doll it's very own character. These dolls are all very small limited edition dolls and most are sold out to dealers nationally! They won't last long! Email kmalone@dollery.com or call 800-447-3655 ext 0 out of state or 781-447-6677 ext 0 in state Ma. For those of you who are new to Heath - Philip sculpts after real children he has found in his travels. He creates a version of the "lost" child and another version of the same child "found." They are beautiful! About Phillip: Philip is a master at capturing a child's heart and soul. All of his dolls are sculpted after real children. Philip's original porcelains sell in the $10,000.00 and up range. He sculpted for Goetz for quite a few years who in turn produced his dolls in vinyl. They started at $500.00 and ended up around $2,000 at the end. Every year he would sculpt a child after a real child he found in his travels and dress one as the "lost" child and one dressed up after they were "found." All of the Goetz dolls are completely sold out and have been for a few. Philip decided to leave Goetz in 2000 and explore other avenues. In 2001 he opened his own company and is currently now painting all the faces of the vinyl dolls himself as we mentioned above. 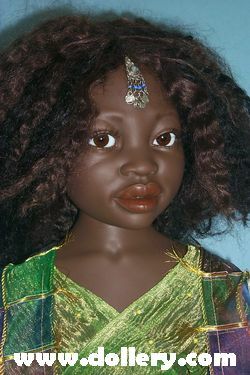 Ulia - Germany Exclusive $1,100 LE/20, 30 inches tall. New for 2004! The rest of the line is coming this week! Stay tuned in or email kmalone@dollery.com. for more info! Standing, Black human hair, mouth blown glass topaz colored eyes, Oxidized silver jewelry. Black mohair wig, mouth blown glass hazel eyes. black Kanekalon wig, mouth blown glass dark brown eyes. Sitting, mouth blown glass dark brown eyes. Back into the times of his grandfather, Adrian is depicted as a little boy from a very poor family playing on the streets of a village in the suburbs of Valencia. His clothes are typical of that period: they are well worn (used and handed down by older brothers) and dirty. His grandmother (abuela in Spanish) has wrapped him up well against the damp and driving winter wind. Now in the present, he is dressed today for the wonderful fiesta of the Fallas in Valenia. The costume is not only very beautiful but totally authentic as Philip commissioned one small family company specialized in the Falla costume to make everything. Because each outfit is made individually, the colors and designs of the waistcoat, head scarf and shawl will change throughout the productions. this is normal as each boy and man obviously prefers to be dressed authentically but always slightly different. Email kmalone@dollery.com or call 800-447-3655 ext 0 out of state or 781-447-6677 ext 0 in Ma to order. Precious Found - Dollery favorite! Precious Lost - Dollery favorite! Ulia Lost - Dollery favorite! Xima Ethnic - Dollery favorite! LE/50 Vinyl $970.00 - SOLD OUT! Xima Lost - Dollery favorite! Xima Found - Dollery favorite! Noa (boy) & Lua (girl) - Dollery favorite! $2900.00 - SOLD OUT, comes with red wooden truck. $2500.00 - SOLD OUT, caucasian baby dressed in white knit outfit and cap. Comes with plush toy bull dog. $1500.00 - SOLD OUT, dark skinned baby with curly afro, dressed in white checkerboard hat scarf and robe type dress. 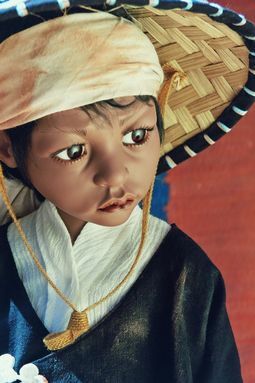 Brown skinned child dressed in black flowing shirt and skirt with black fabric hat with tan embroidery. Has fan. Brown skinned child dressed in white flowing shirt and skirt with white fabric hat. Caucasian girl dressed in black dress with wide brimmed black hat, black socks & shoes. Comes with dolly dressed in white and a black & white polka dotted pinafore. Caucasian girl dressed in white dress with white button vest and a spray of flowers on her head, no shoes or socks. Comes with doll with similar flowers on head dress in a white dress with a white and black polka dot pinafore.